Talk about an easy gift! 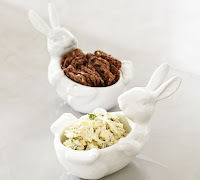 Your kiddo will love that he.she made it almost by themselves and you'll love that there's almost no mess! Just put a small glass cup or jar inside of a larger mason jar. Fill the space between the two jars with plastic refrigerator magnet letters and numbers. Fill the smaller, inner jar with water to put your beautiful bouquet in. Get your child to pick some wildflowers for that extra, special touch. 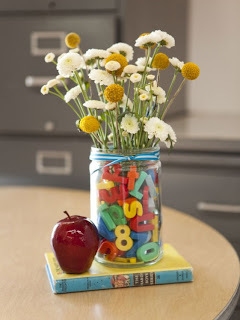 For an additional touch hot glue an apple and the vase to an old child's book as shown. 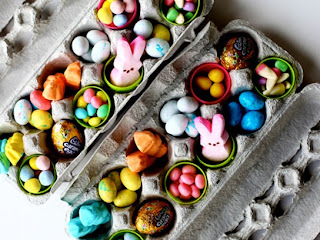 This craft is so super-cute, creative and so easy, your kid probably won't need a lot of help to make. 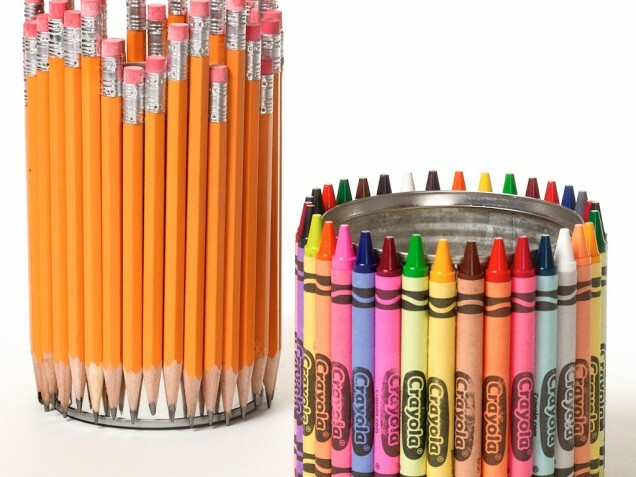 Recycle a tin can and attach your pencils or crayons with tacky glue. 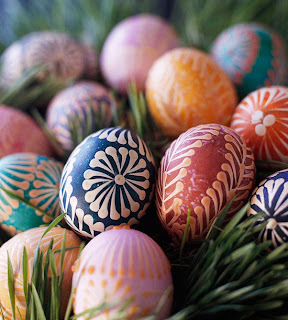 Wrap the whole container with one strip of ribbons all the way around to hold it in place as the container is drying. 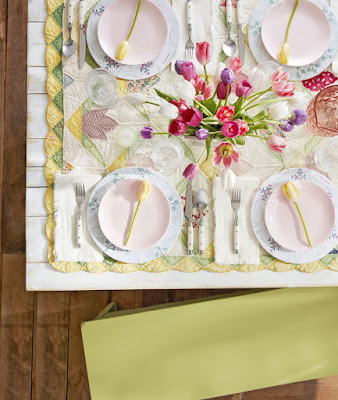 Remove the ribbon or tie a bow and voila! 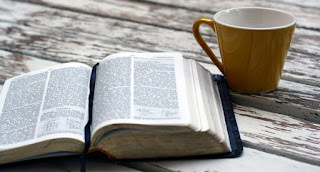 You have a heartfelt gift that was no stress and hardly any mess. This is DIY spa product wrapped up in a pretty package and if anyone needs a Calgon take-me-away moment, it’s a teacher (especially after the first day.week of school)! Just combine Epsom salt, baking soda, table salt and essential oils to make the bath salts. Let them dry for 24 hours. 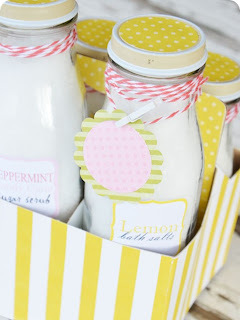 Then pour into decorative jars, and pretty them up with labels and ribbon or string. 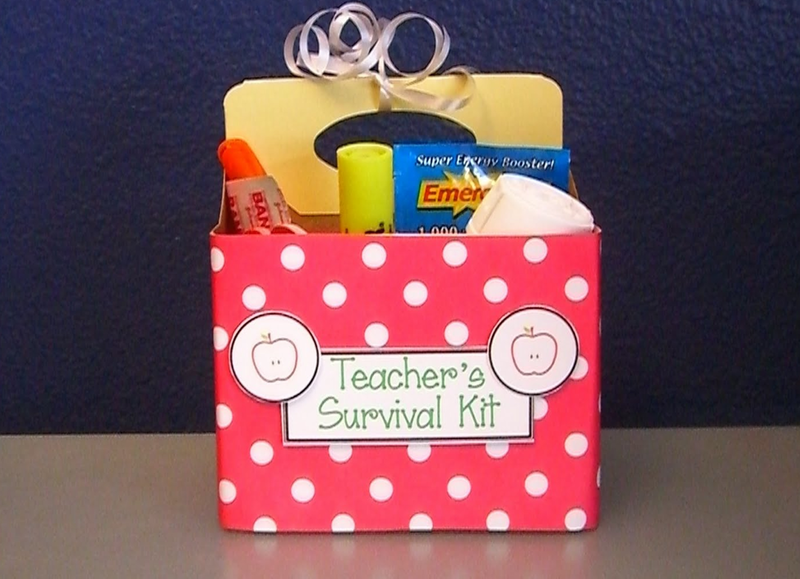 Gifts can get pricey, but here's a DIY that uses the school supplies you already have on-hand! The best part? The clock only costs about $4 at Dollar Stores. You're going to need a computer, card stock, basic wall clock, and some school supplies. Design your clock face on Microsoft Word, or the like, and print it out on an 8 ½" by 11" cardstock, cutting an 8 inch circle around the center of your design. Use a small screwdriver to remove the screws on the back of the clock, and trim the hour and minute hands with wire cutters to make them 1.5" long and 2.5" long. Set clock hands aside. 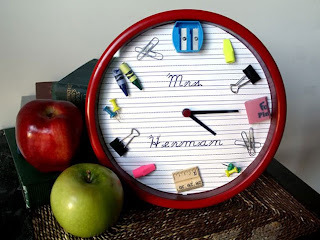 Place the cardstock circle on top of the clock face, careful to poke a hole for the center. This is so you can reattach the clock hands. Place small school supplies you've gathered such as broken crayons, pencil sharpeners and erasers around the clock where numbers would be. Reassemble the clock, clean the glass and this fancy gift is done in no time! This apple with caramel dipping sauce is a delicious gourmet update on the traditional "apple for the teacher". Plus, if you're pressed for time or not super crafty, this is the perfect I-almost-forgot-night-before gift. Mix some caramel dip (you can find it at your local grocery store in the produce section) with 8 ounces of cream cheese. Then, layer the mix with plain caramel dipping sauce and some Heath Bar bits in a 1/2 pint mason jar. 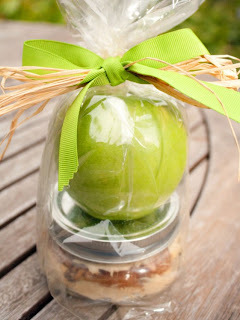 Seal the jar and place it in a cellophane bag. 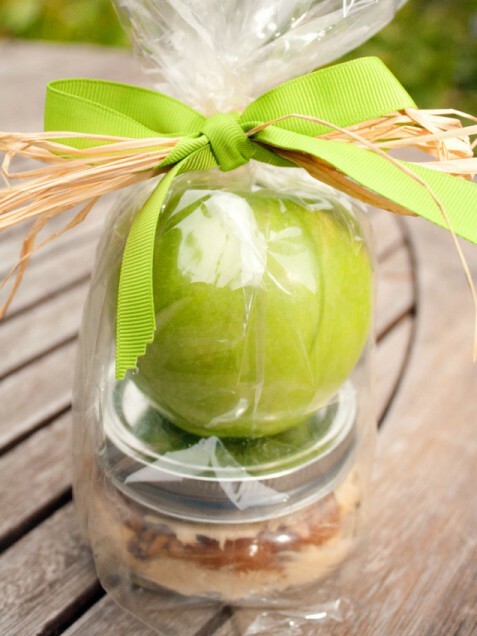 Before tying up your bag with a pretty ribbon, place a fresh apple on top of the jar.